This reference 6332 Oyster Perpetual dating to 1954 is quite an uncommon watch. The 1979 riveted ROLEX bracelet is very clean and valuable on its own and is the same style as would have been seen in the 50’s. The 34mm. steel case glistens to perfection. The original dial has aged naturally over time adding character and proof of originality. Notice the uncommon sunken dial variation this ROLEX boasts. The Dauphine hands and sweep second are original. The ROLEX NA movement is automatic-meticulously cleaned and is accurate. This fine ROLEX even has its correct BREVET crown with the cross insignia. 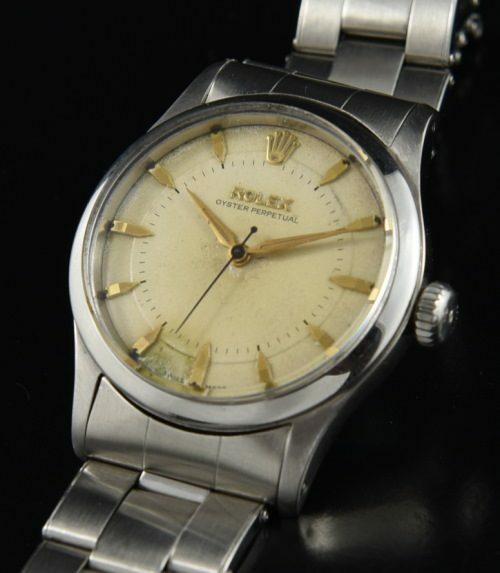 This true vintage ROLEX classic is a steal at this price.